Click here to view the Memory's Wake book trailer. I received a copy of Memory's Wake in exchange for an honest review. This book was kind of amazing. I've read A LOT of books about fairies and while I do enjoy them, the concept can get a little stale. This book, however, was completely original and the polar opposite of stale. 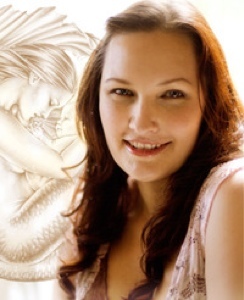 The world Fenech created is rich and vibrant and her characters are well-developed and loveable. The story is action packed and kept me on the edge of my seat. This is the story of Memory (a nickname because she cannot remember her actual name). Memory wakes up from what seems to be a nightmare and she has no idea who she is or where she is. She meets a pale girl named Eloryn who is dressed completely differently than Memory. Eloryn is also on the run and decides to help Memory get her memories back. They venture through a world of dragons and fairies trying to navigate who they can trust. 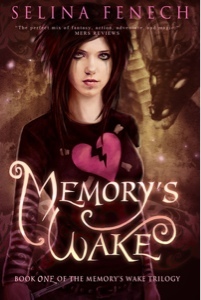 Memory has to decide whether she wants her memories back even if they are terrible. The first thing I'd like to comment on is the artwork in this book. It's fairly uncommon to see artwork in novels, but what's even more uncommon is art work as beautiful as that found in Memory's Wake. There are a ton of black and white (kind of looks like charcoal) drawings of characters and scenes from the story. They're well done and really add something to the story. I found myself looking forward to the next drawing throughout the book. This story is ultimately about two girls trying to find their place in the world. Ok, maybe the world in the book is a mystical one full of strange creatures and characters, but the point and theme is the same. I love that this story manages to combine an epic fantasy adventure story with an important theme every young girl can relate to. I'll always get on board with an exciting story with heart. This book is a serious page turner. I ripped through it in two sittings, unable to put it down. The characters are genuine and had me rooting for them (especially Memory). The story is a thrill a minute, but also smart and well thought out. The writing is smooth, concise, and witty. For the first time in quite a while I really have nothing bad to say about this book. Not a single complaint. So, in other words, this book was perfection for me. I can't wait to see what happens next for Memory! Click here to see more awesome blog stops on the Memory's Wake tour! Wow, such a fantastic review, thank you!